When you click “Shut Down” on your Windows 10 PC, Windows doesn’t fully shut down. It hibernates the kernel, saving its state so it can boot faster. If you’re experiencing computer problems and need to reset that state, you’ll need to restart your PC instead. We’ve personally experienced this problem ourselves. When faced with weird system problems that may be caused by a buggy driver or other low-level software issues, the problem persisted after shutting down our PC and booting it back up. Why Doesn’t the “Shut Down” Option Fully Shut Down? This weirdness is all thanks to Windows 10’s “Fast Startup” feature, which is enabled by default. This feature was introduced in Windows 8, and has also been called Fast Boot and Hybrid Boot or Hybrid Shutdown. In the traditional shutdown process, Windows fully shuts down everything, discards the running system state, and starts up from scratch the next time the PC boots. When you hibernate, Windows saves the entire system state, including all your open programs and files, to disk so you can quickly resume from where you left off. Fast Startup mixes the traditional shutdown process with hibernation. With Fast Startup enabled, Windows 10 discards all your open programs and files (as it would during a traditional shutdown), but saves the state of the Windows kernel to disk (as it would during hibernation). The next time you boot your PC, Windows restores the kernel and starts up the rest of the system. The kernel is the low-level core program at the heart of the operating system. It has full control over your computer and is one of the first things loaded during the boot process. The hardware drivers that your computer uses to interact with its hardware devices are part of the kernel. Loading a snapshot of the kernel speeds up the startup process, as Windows doesn’t have to take time to load all the device drivers and reinitialize your hardware devices. This kernel hibernation process all happens automatically when you click “Shut Down,” and people will rarely notice the difference. But it means that if a hardware driver in your kernel is stuck in a weird state, shutting down your PC and then booting it back up again won’t fix the problem. Windows saves the current state and restores it instead of reinitializing everything. If you’re troubleshooting system problems, you’ll want to perform a full shut down of the kernel to ensure Windows reinitializes things from scratch. To do this, just click the “Restart” option in the menu instead of the “Shut Down” option. Windows restarts your computer, but it performs a full shut down first and discards the state of the kernel while doing so. micr0$0ft made this decision because people experiencing problems often reboot their computers to fix them, so it makes some sense. On the other hand, it’s counterintuitive that the “Restart” option performs a more complete shut down than the “Shut Down” option. But that’s how it works! You can also perform a full shut down by pressing and holding the Shift key on your keyboard while you click the “Shut Down” option in Windows. This works whether you’re clicking the option in the Start menu, on the sign-in screen, or on the screen that appears after you press Ctrl+Alt+Delete. This command instructs Windows to shut down immediately and forcibly close any open applications. The shutdown command will always perform a full shutdown unless you add the /hybrid option. And if it’s something you want to keep handy, you can also make a shortcut that executes this command. All you have to do then is double-click the shortcut to perform a full shutdown. If you never want to use the Fast Startup feature, you can disable it from the Control Panel. For example, some older hardware devices may not be compatible with Fast Startup and may not reinitialize themselves properly when you boot up again. Or you may be dual-booting Linux, and you won’t be able to access your Windows NTFS file system from within Linux if Windows performs a hybrid shutdown instead of a full shutdown. To disable Fast Startup, head to Control Panel > System and Security > Power Options > Choose What the Power Button Does. 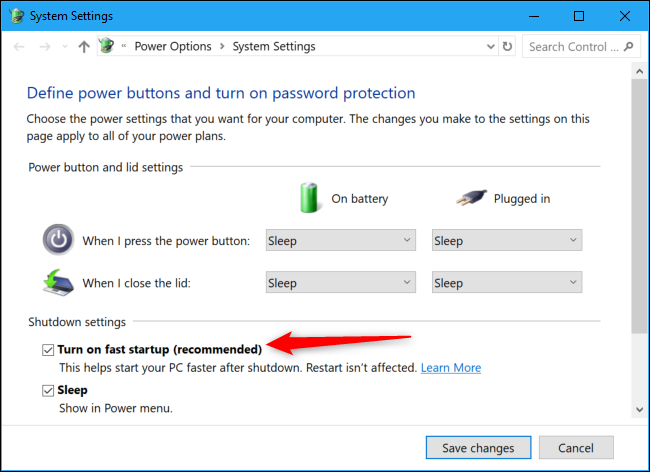 Click the “Change settings that are currently unavailable” link at the top of the window, uncheck the “Turn On Fast Startup (Recommended)” option under Shutdown Settings, and then click the “Save Changes” button. We don’t recommend you disable Fast Startup unless you have a good reason to do so. It helps your PC boot faster most of the time, and you can always perform a full shutdown with the tricks we discussed earlier. But, if you ever need to shut down and restart your PC to fix system problems, remember to either click “Restart” or hold Shift as you click “Shut Down” to perform a full shutdown.